A new phone is exciting and it takes a little time to learn all of the cool things you can do with it. But do you know that rooted Galaxy S5 could do so much more than you first start using it as a branded new device? Rooting allows you to do much more with your phone. It gives you access to the root directories, which are otherwise off limits to users. You can choose to run special apps for customizing the appearance, it can be used for wireless tethering, making the device operate faster, and the list goes on. If you're doing it on your own and it’s the first time you've attempted it, the process can be overwhelming. When your Galaxy S5 is not rooted, you are missing out on using it to its maximum capabilities. You deserve to enjoy the full range of options and operations when using your phone. When you're going it on your own, without specially designed software to help along the way, the rooting process can be difficult. You're in the right place to avoid all of the hassle and frustration that can accompany the process. 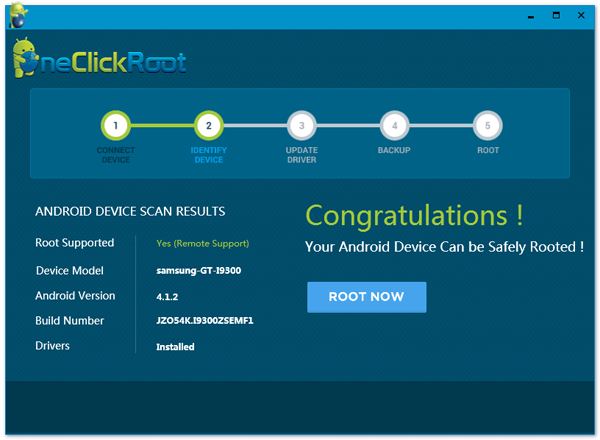 AnyRooter Android Root is the software that can provide you with fast, easy and secure rooting solution to S5. It takes the hassle and worry out of the equation. Even if you are among the most inexperienced users, you'll be able to use this professional rooting app to safely and securely root your Samsung Galaxy S5. Root Android phone and tablet within 1-click. Success rate of rooting over 95%. Fully rootable from Andorid 2.0 to Android 5.1 . Support Galaxy S5 in all provides, such as AT &T, Sprint, T-Mobile. Click the download button above to download and install the program on your Windows PC or Mac. It works perfectly on both computer systems. There is a default installation wizard embedded in the program, making its extremely easy to install the program. May be you already turned the function on. If yes, then you can skip this step and move to the next one. If not, then you should follow the instructions to enable USB Debugging on your Galaxy S5. G to Settings and scroll to About phone, then tap Build number repeatedly until it says You are now a developer. Then Developer Options is turned on and enable USB debugging on there. This rooting program USB ADB to communicate between it and S5, so you need to connect your device to the computer, so it can make full use of ADB and make it more secure during the rooting. 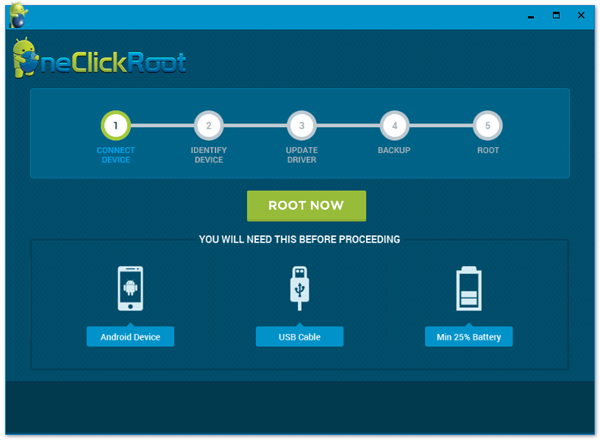 When everything is prepared, click ‘Start Now ’ to begin the rooting process. In this time, AnyRooter will first identify your device, then download and upgrade corresponding drivers, and make a back up for you phone in case of any damage. After these, it will start rooting your phone with its patent-protected rooting algorithms. You should be getting the most from your Samsung Galaxy S5. Why shortchange yourself when it comes to the range of apps and operations you can be accessing? Simplify the process of rooting your phone with AnyRooter Android app for the maximum possible performance and enjoyment of your device. Also, support staff is available to provide you with help along with way with our live chat option. Testimonials from satisfied users show that AnyRooter is committed to providing top quality products and services to each customer.